If Fairfax Resigns, What Happens to the Lt. Governor Post? So far, Lieutenant Governor Justin Fairfax is resisting calls for him to step down. But what happens if he resigns? The last time that Virginia had a vacancy in the role of Lieutenant Governor was back in 1971, when 34-year-old Sargeant Reynolds died of a brain tumor. At that time the Senate majority leader presided over the Senate until a special election was conducted five months later. But Reynolds died before the new 1971 Constitution took effect. So Virginia has no real precedent for filling the job under the current rules. Virginia legal expert Rich Kelsey says the current Constitution is clear. “It is rock solid — not subject to interpretation — the Governor gets to make the appointment, and that appointee serves until the next general election.” That’s the next general election for Lieutenant Governor, says Kelsey, which is in 2021. That means whoever the governor appoints to the job of Lieutenant Governor will likely serve for more than two years and be first in line to become governor in the event that Ralph Northam decides to step down after all. State Sen. Jennifer McClellan, D-Richmond, second from left, is sworn in as her mother, Lois McClellan, left, holds the Bible, and her husband, David Mills, holds daughter Samantha and son, Jack, during the Senate session at the Capitol in Richmond, Va., Friday, Jan. 13, 2017. McClellan took the seat of US Rep. Don McEachin who was elected to Congress. 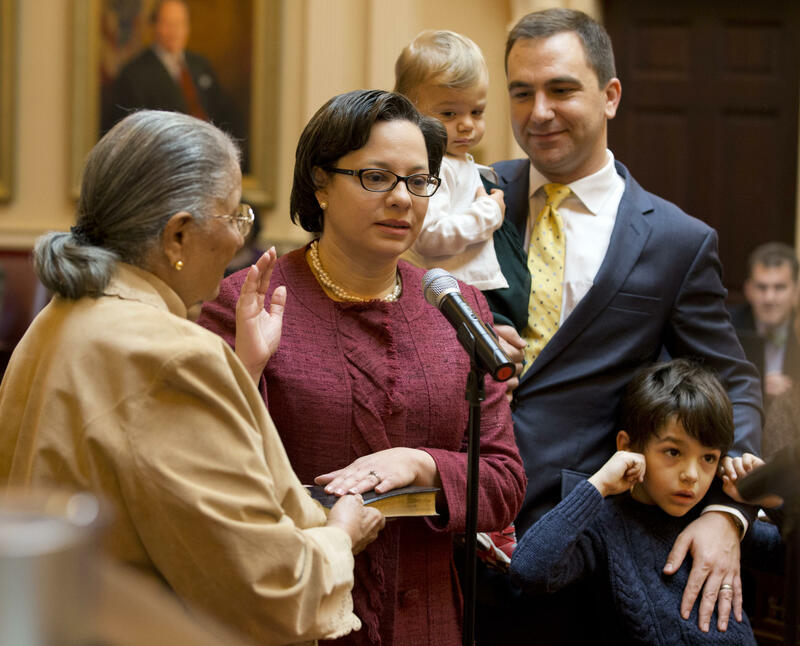 At the top of the list of names being floated as potential replacements to fill the role of lieutenant governor: state Senator Jennifer McClellan of Richmond.